The more attentive and/or regular readers among you may have noticed that I talk about the GSX-R 750 quite a lot – in fact I make no secret of the fact that I own a 2000 model. So when Suzuki offered us a 2003 version to test it seemed like an ideal opportunity to see how much difference three years – a lifetime in modern motorcycle terms – would make. 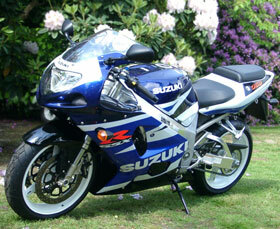 Collecting the bike from Suzuki’s workshops reminded me of just how good looking it is. Even now, it’s still one of the best looking bikes to come out of Japan. The back end could probably benefit from a subtle modernisation but the overall effect is still very pleasing. 2003 models differ cosmetically by having lighter, simpler mirrors and slightly altered indicators. And that’s it. Clearly Suzuki’s engineers agree with the “if it ain’t broke, don’t fix it” philosophy. The chassis received some changes in 2001, adding the facility to adjust the swingarm pivot and thus change the chassis geometry, but only with parts which came with the full race kit. Engine changes, again in 2001, are limited to a subtle tweak of the injection which replaced the cable driven throttle secondary butterflies with stepper motor driven ones instead. In other words, there’s not a lot changed. Even the graphics are almost the same. Well, at least the learning curve shouldn’t be too steep. GSX-R 750s were always the purest of the family – built solely as a platform for racer homologation and as such less compromising and more sharply focussed than all the other pretenders. This incarnation, though, while still very obviously race biased, is one of the more useable sportsbikes on the market. As a result it is blessed with a horn that works, mirrors that allow a view of the road rather than the elbows and a riding position that allows a day’s riding to take place without a pre-booked osteopath appointment at the end of it. Having had a 2000 model for three years, I can testify to it’s day to day usability as a commuter, tourer and trackday weapon par excellence, as well as anything you may care to think of between those extremes. Riding the new bike is similar in many ways to the old, as you might expect. What seems to be improved, though, is the throttle response as the new butterflies work their magic making what was already the best injection on the market even better. The brakes are the same, being adequate without being particularly outstanding, and this is probably the only area of the bike that I would consider a weakness. Although they actually work quite well, the brakes lack the immediate bite that you might expect for a bike with this performance, and the slightly unnerving sensation of things not quite happening fast enough can dent the rider’s confidence in the ultimate ability of the machine. Something else that hasn’t noticeably changed is the chassis, which is one of the finest ever made. Handling is excellent, with a crisp turn-in allied to excellent stability. The standard fit steering damper keeps a slightly over-firm hand on the front end, but becomes unnoticeable as speeds increase. The GSX-R seems completely unflustered by accelerating hard out of bumpy corners, trailing the brakes into greasy roundabouts, being chucked around with laden panniers and a squashy bag bungeed on the back, whatever. It just takes what you throw at it and gets on without fuss. The motor is unusually flexible, pulling cleanly (albeit not very strongly) from low revs in any gear and delivering a wonderful rush of top end power. It sounds great too, with a lovely crisp rasp that sounds almost as though it’s barking at you as you blip the throttle. The gearbox is typically Suzuki, with a light positive action and plenty of feel through the cable clutch. It’s not the most frugal of bikes, being thirstier than some of the larger machines it is up against, but still manages around 130 miles before hitting reserve. Overall, this is one of the easiest bikes to ride that I know of. There is enough power and torque to make rapid progress quite straightforward but not so much as to make the bike intimidating. 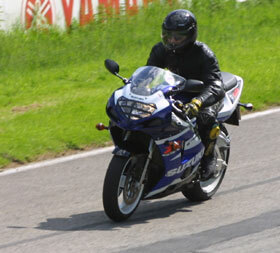 The handling is nimble enough for track days while stable enough not to be nervous or twitchy. And the riding position is as committed or as relaxed as you are. The only reason it isn’t a best seller is the fact that people either want cheaper insurance and go for a 600 or they want the most of everything and so they go for the 1000. The demise of 750s as a World Class racing capacity hasn’t helped. But if you’re in the market for a supersports bike and you don’t want to work too hard to get anywhere then give the 750 a try. You’ll be amazed how little it gives away to the 1000, and you’ll be astounded how much quicker and easier it is than the 600. 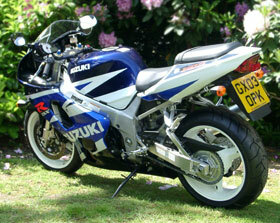 Read external Suzuki GSX-R750 reviews on ciao.